Allegedly 9 out of 10 new riders preferred the Kawasaki ER6 ’05 – ’08 over any other middle weight bike. Kawasaki came into the market with their ER6 and simply dominated, leaving the other manufacturers wondering what happened. A victim of it’s own success in lightweight engineering there are not as many fitting kits and solutions available for this commanding mid range as some other bikes in it’s class but they are explained below for those that have picked up an ER6. In order to mount a topbox to the bike you will need the specific arms, the 445FZ. The arms only support one type of Monokey plate at this time, the M5M, usually Monokey luggage will hold up to 10 Kgs in weight however because of the lightweight subframe of the ER-6 the maximum weight this box will hold in this instance is 6 Kg and no more! Givi 445FZ Arms with PL174 hard pannier supports. 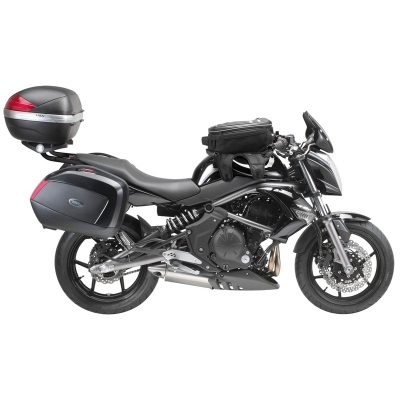 The ER6N accommodates the Givi V35 Panniers using the PLX445 in conjunction with the 445FZ Monorack arms. At this time if you just want the hard panniers then you will need the Monorack regardless of whether you need a topbox or not. 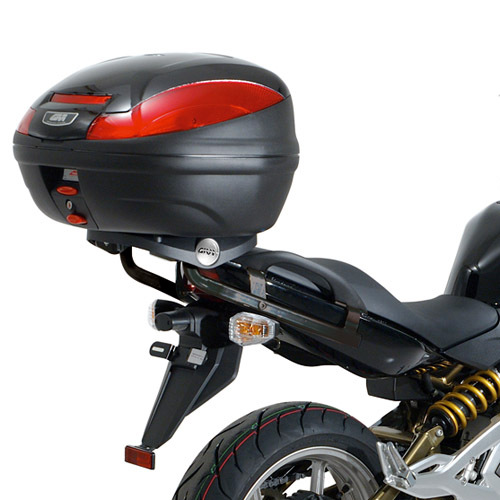 If you want soft panniers and don’t need a topbox then you’ll need the T262 which is a tubular support that holds the soft panniers free from the hot exhausts. There is a specific, transparent screen available called the D404S which is lightly tinted and designed for the faired version of the bike. It is 8.5cm higher than the factory standard and is a direct replacement which does not require an additional fitting kit for this. Should you wish to fit the Givi universal screens 245N, 246G730 or the 246N902 then you need the fitting kit A448A for this bike, the listed screens are recommended since they have a black inlay which prevents reflection from the headlamp. That’s it for this bike, be sure to keep checking back in the future for more bike overviews and how to fit them all together.